Justina was aware of the prejudice against Italians among both Catholics and non-Catholics. Her religious community, like the Midwestern city in which it was located, was composed of many more Irish and German Catholics than Italians. 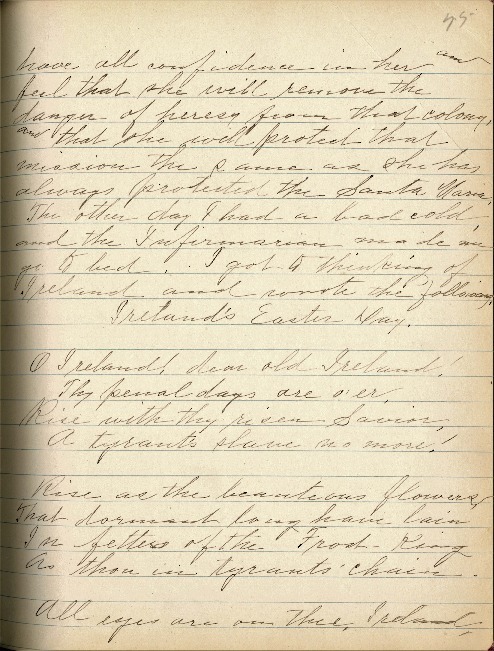 This poem celebrating the controversial Easter Rising of 1916, which was venerated by Irish nationalists, suggests that Justina’s experiences as a Catholic immigrant encouraged her identification with her Irish co-religionists. This journal entry records her poem and the circumstances under which she composed it; note her comment at the end of the poem. A tyrant’s slave no more! As thou in tyrants’ chain. To give world-peace to earth. She see her Easter Day! O Ireland, faithful Ireland! For centuries hast thou borne The Lent of Crucifixion. Hail now thy Easter Morn! You wouldn’t think an Italian wrote that, would you?